Using video on your website is a fantastic way to engage potential customers. More and more people prefer to learn about products and services through video over traditional text. It also gives you a much more creative way to explain your business. You can use videos in many different scenarios including product introductions, customer testimonials or simply explaining how your company works and what it brings to the customer. Pernille Bülow By You has five workshops in Denmark and Sweden where you can visit and make your own glass art. 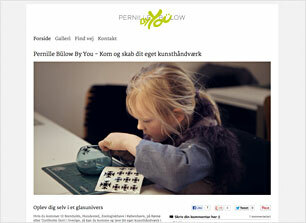 On her mono website Pernilla uses video in a great way. The video takes you into one of her workshops and immediately gives you a feeling of coziness, the atmosphere and of course the amazing things you can do in the workshop. Le Gourmands adds new video on their mono website each month where they presents new products and provide tips for how they can be included in various dishes. The videos give an honest presentation of the business and shows the passionate business owner who speaks with warmth and enthusiasm about the delicious products. 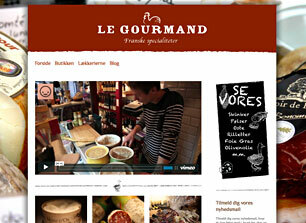 A great website for the gourmet enthusiast. 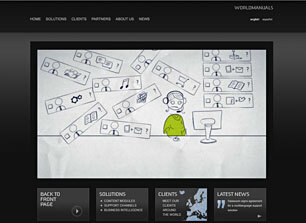 On WorldManuals mono website you can see an animated video that tells about their services and products that they deliver to their customers. Animated videos can be a useful tool for explaining complex issues, processes and products. It gives users a quick introduction to what the website and the company is all about. 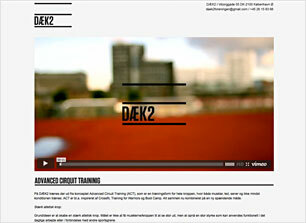 DÆK2 offers physical training based on the concept of Advanced Circuit Training (ACT). To give an insight into the type of training that they offer, they have chosen to put a video on their mono website where they show examples of the training circuits. At the same time, the video gives an impression of the mood and spirit of the training teams.